Three people were killed in Zimbabwe's capital Harare after troops opened fire on rioting opposition supporters, police say. The government says the army was deployed in central Harare to help police restore order. The opposition MDC Alliance condemned the crackdown, saying it was a reminder of the "dark days" of Robert Mugabe's rule. Parliamentary results show the Zanu-PF heading for a big majority. The presidential result has yet to be declared. However, the MDC Alliance insists that its presidential candidate, Nelson Chamisa, won Monday's election. European Union monitors have expressed concern over the length of time it is taking to declare the presidential result. What are the two sides saying? President Emmerson Mnangagwa said the opposition leadership was responsible for Wednesday's violence, which he alleged was designed to disrupt the electoral process. He had earlier urged patience and calm following the first elections since long-serving ruler Mr Mugabe was ousted from power. Justice Minister Ziyambi Ziyambi said the army had been deployed in Harare to disperse a violent crowd and to restore "peace and tranquillity". He added: "The presence of the army is not to intimidate people but to ensure that law and order is maintained. They are there to assist the police." A spokesman for Mr Chamisa condemned the deployment of soldiers and the subsequent loss of life. "Soldiers are trained to kill during war. Are civilians enemies of the state?" he asked. "There is no explanation whatsoever for the brutality that we saw today." Correspondents say the violence was confined to the centre of Harare - an opposition stronghold - while other parts of the country remain calm. Latest reports from the capital suggest the security forces are in control of the streets. Army vehicles and police trucks rolled into Zimbabwe's main city on Wednesday after the wait for the election results took an ugly turn. MDC Alliance supporters had been gathering in various parts of Harare since the morning, but when news came that Zanu-PF had won the majority of seats in parliament and that the presidential results were not ready, the previously upbeat mood changed. 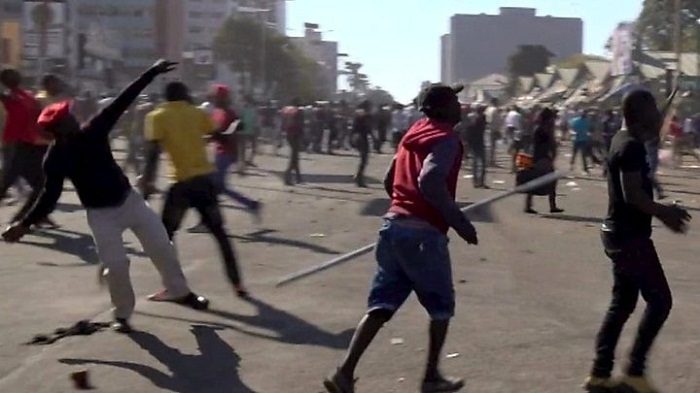 Opposition supporters went on the rampage down Harare's busy streets, heading towards an old Zanu-PF office and carrying large stones, sticks and anything else they could grab along the way. The crowd chanted: "We want Chamisa." They believe the election has been stolen, and are demanding the MDC be announced as the winner. Riot police using water cannon and tear gas arrived to a chaotic scene of burning tyres and an unrelenting crowd. There were hundreds of them. They jeered and pelted the police vans with stones. In another part of the city where more opposition protesters had gathered, the army used whips to disperse them. Today's clashes may not have been on the scale of the "days of old", where intimidation by security police was the order of the day, but it's certainly not the peace many had been praising until now. Something has changed here. What results have been declared? State broadcaster ZBC had reported that the electoral commission would announce the presidential results at 12:30 local time (10:30 GMT) on Wednesday, but only parliamentary results were read out. The BBC's Shingai Nyoka reports that the announcement on the presidential poll was not made because representatives of some of the 23 candidates had failed to turn up to verify the results. The EU mission has criticised the delay in announcing the presidential results. Zec has until Saturday to do so. It said it had observed several problems, including media bias, voter intimidation and mistrust in the electoral commission, adding that there was an "improved political climate, but un-level playing field and lack of trust". The African Union mission has said the elections "took place in a very peaceful environment" and "were highly competitive". It added that it could not confirm opposition parties' complaints of vote-buying, intimidation by the state and bias by traditional leaders. A preliminary report by the Southern African Development Community (Sadc) observers said the elections were largely peaceful and conducted in accordance with the law.